This guest post was contributed by Ryan Johnson, who is the SEO Program Manager at Ricoh USA, Inc. In my experience, most Fortune 500 companies do not have a solid SEO strategy in place, and Ricoh USA, Inc. was no exception. After a series of recent web refreshes, our organic traffic was dropping precipitously. Some companies want an SEO strategy, but they don’t want to make the changes and investments that are needed to succeed. In our situation, we already had a good staff and we were working on an agile methodology, so for us, it was a good situation to enact an SEO strategy. We needed help prioritizing necessary changes and bringing together our content, development, distribution and analytics capabilities to maximize organic search. Over the course of the next year, I’m going to write on the LinkedIn Marketing Solutions blog and take you through the first-year of the SEO project at Ricoh. We’ll look at planning, implementation, final measurements, and learnings. The SEO strategy we’re implementing can be applied to almost any business, regardless of size, as long as you have the buy-in and dedication to make it a success. Let’s start by looking at the foundation, the ground-level, that has to be laid before you can start a successful SEO program. There are three rules that you have to establish before you can approach an SEO program. When I worked as an SEO consultant at another company, I turned down clients who balked at some of the hard decisions that come with implementing an SEO program. 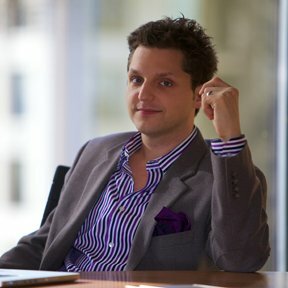 Without complete company-wide buy-in, in my experience, the program will not work. SEO projects require changes in the way a website is written, coded, and designed. If you don’t have the workforce to make changes in a timely manner, don’t bother starting an SEO program. You have to be realistic about what your current staff capabilities are. Developers and writers are not trained in SEO, and that’s okay. They are great at what they do, and SEO hasn’t traditionally been a part of their workflow. For larger sites, you may need to take on some temporary staff or hire an agency to take care of some of the minutiae that is involved in what could be a large-scale website and content overhaul. SEO will not solve poor customer service or bad reviews. It won’t make a bad sales staff better. What it can do is help you optimize your content and website to bring in searchers who are likely to be interested in your products and services. SEO requires you to “kill your darlings.” It’s about saying goodbye to those branded terms that you might have agonized over. It’s about realizing that some content may not connect with your audience. SEO is about using data – not ego – to make decisions. Enacting an SEO plan requires everyone – managers, sales staff, designers, developers and writers – to sacrifice some individual choices for the common good. If turf wars are common at your company, you probably aren’t ready for SEO yet. 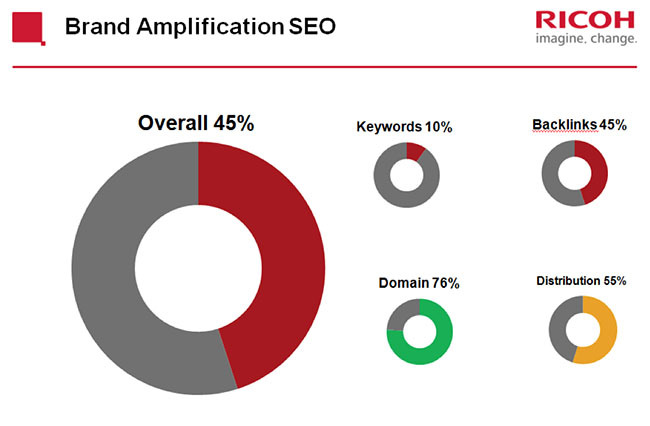 Now that we’ve set the scene, let’s look at what the first quarter of an SEO overhaul looks like at Ricoh. Before you start talking, do some listening. Find out what the company’s motivations are. Learn how to fit SEO into the flow instead of ramming through projects. My first step at Ricoh was to identify everyone who has a role in the website, including content creators, developers, analysts, sales people, executives and content managers. We talked about what their experience with SEO was, how it had been or had not been effective up to that point, what workflow looked like, and what the site should have been doing that it was not. After interviewing these stakeholders, then I was able to develop a strategy, because I know what works, what the company wants to happen, and the people I need to work with to get things done. A successful SEO project requires narrow scope. These projects get bogged down by trying to do too much too soon, and result in a lot of half-completed SEO. This year, we will only focus on two projects. These are big projects, and we can only make progress by maintaining a very narrow scope and ignoring all potential distractions. Through stakeholder interviews, I found that Ricoh’s biggest concern was reinvigorating its products, solutions and services pages, which had seen significant drops in organic traffic following a site refresh. With that knowledge (along with the basic understanding that this is ultimately a business site), I could focus solely on maximizing those pages for search in 2017. I know that other sections of the site will continue to have added non-optimized content. I know that large swaths of the site will still be in bad shape for search. And that’s okay. A narrow project focus, excluding everything else, helps avoid wasting time putting out fires (i.e., “We decided to add a new section to the website, and we really need keywords.”). Secondly, it helps circumvent any institutional turf wars that may arise (“I want my part of the website done now.”). A second major priority for us was getting a handle on the many external domains the brand had created over the years. 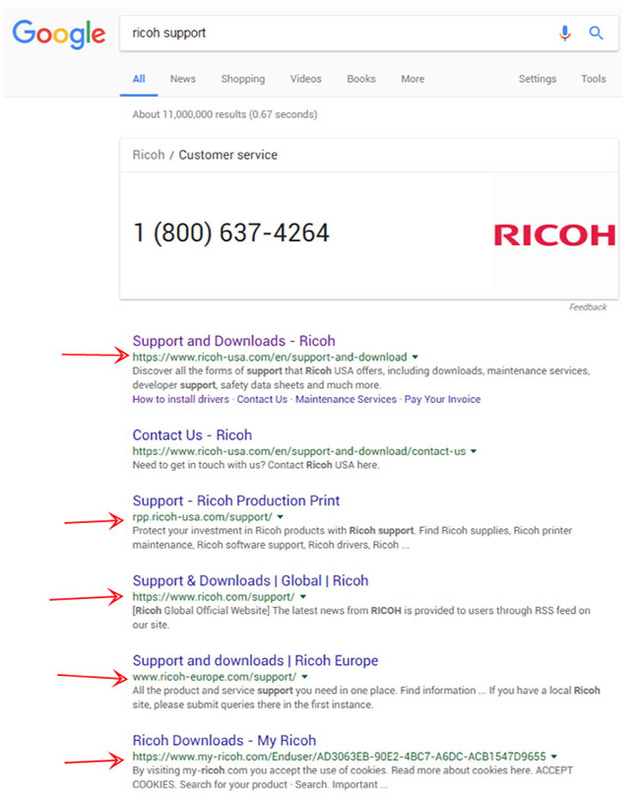 As you can see in the screenshot below, a search for “Ricoh support” pulls up five different Ricoh domains or subdomains. This makes it very difficult for our customers to know where to go for help. What you see here is a small sample of the dozens of stray domains we have floating around. Google determines authority by links to your site from other websites, especially links from stronger websites. When you create multiple domains, you split up your site’s potential links up among weaker websites that don’t have a chance of competing in search rankings. When all of your links go to one website, that website is much stronger and can compete in more searches. Think of it this way — - would you rather go into battle with one strong battleship or 100 potato guns? With this many domains, where is a customer supposed to go for help? Most businesses do not track nearly enough keywords, instead they focus on a handful of broad, unobtainable, poorly targeted keywords. 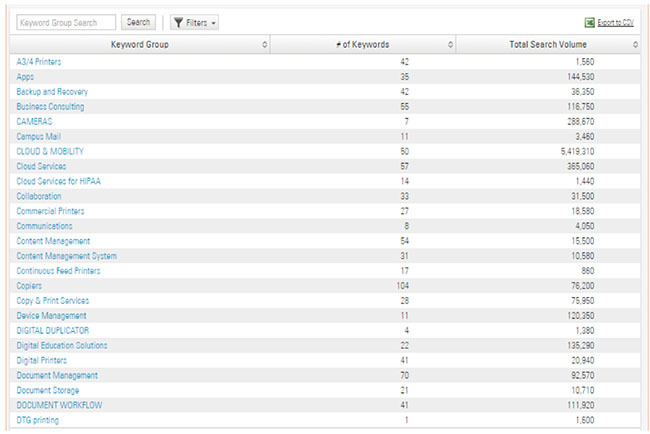 An expanded keyword universe will help us track all of the ways customers are searching for our products and services. Research your competitors – What are they ranking for? How are we going to know if all of this is working? Too often, projects are undertaken without laying out what success looks like. 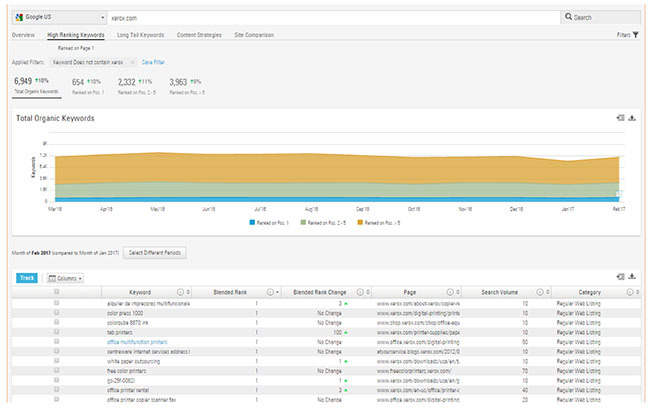 We started with a full SEO audit of the site, using a scorecard that provides weighted scores based on a site’s technical functions (is the site’s functionality affecting its search potential? ), content (is content well-written? Is it keyword optimized? Is meta content being used properly?) and brand amplification (looking at domain strength, keyword rankings, social media capabilities, content distribution and backlinks). Now that we have a baseline, we will be able to judge the results of our program and justify it to the C-suite. I used this data to build out projected results for 2017 and to paint a picture of success for the end of the year. The goal of an SEO program should be to create an organization of SEO experts, with SEO baked into the normal way of doing things. In my years of SEO work, I’ve noticed that almost every business – including large advertising agencies and Fortune 500 brands – have almost no idea of how SEO works or how to implement it properly. The biggest factor in SEO success is buy-in, and buy-in requires constant education. I want to be available as a resource, but I also want people to be empowered to know that they are making the right decisions from a search standpoint. Otherwise, your SEO team will spend their time putting out fires instead of focusing on the larger strategy. Keep teaching, embrace teachable moments, and create a culture of knowledge and empowerment. When someone asks for help, we don’t do it for them — – we teach them how to do it. You can’t create content and then tack on SEO at the end. SEO research needs to be a part of any content marketer’s creation process. We’ve set up training sessions with content creators to help them create content that will succeed in search and appeal to an audience that is interested in our products and services. This means crossing the line from writing for captive audiences (brochures, magazines) into writing for the web. A robot has to read your page and determine what it’s about, so you have to write with intent. Use the keyword universe we created and use related keywords on each product page. Rewrite subheads like this to tell search engines what the product is and does. Something like "Improve Print Speed with Short Warm-up Times". Training includes learning how to write meta content and headlines, doing keyword research using our existing keyword library and Brightedge, selecting appropriate primary and supporting keywords. As the year progresses, we will continue revisiting these principals as we continue updating our product and services pages. Would a customer search for "Intelligent Delivery?" Probably not. Optimize your page using more standard terms like "digital mailroom" and "mail digitization services." When the website isn’t working, the first thought is often, “We need a new website.” However, there are a lot of easy SEO fixes that your tech team can implement that will generate significant SEO improvement without much effort on your current site. We’ve set up trainings with web developers to talk about common SEO killers in website design and how to avoid them. Web designers and developers are usually not SEO experts, so they need to understand how seemingly innocuous design elements can harm organic search. Some of the items I’m talking about with Ricoh’s developers include URL structure, proper use of schema and robots.txt, applying HREFLANG tags, using canonical URLs and the problems with multiple domains in user experience. 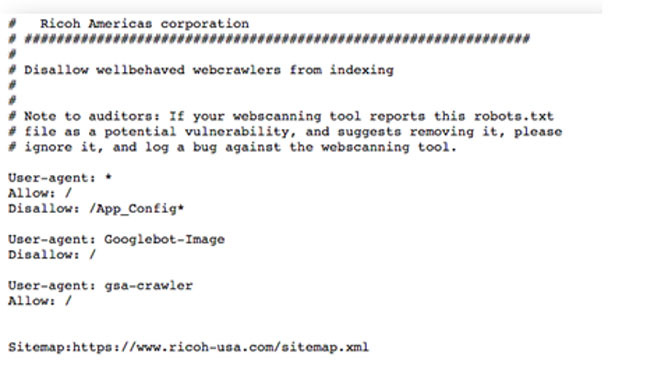 We can start controlling how crawlers read our site by updating this robots.txt file. This is one easy SEO fix that can be applied right away. Most important, we are setting up training sessions with our executives. Often SEO programs falter, because executives do not understand what it is and why it’s important. This requires a clear, unvarnished look at where we fall behind competitively, a clear action plan for the year, and then measurable metrics to show success. I’ll keep you posted throughout the year, describing the program as it unfolds and what the results are. My hope is that you’ll be able to use these pieces as a template for your own SEO program rollout. To make sure you don’t miss the next installment of Ricoh USA’s SEO project — and our daily coverage of the latest trends in digital marketing — subscribe to the LinkedIn Marketing Solutions blog today.